It’s been 13 years since Mary Grams lost her engagement ring in the garden — a secret she shared only with her son. Now, Grams’ ring could be the talk of her small town, she said, after it was found wrapped around a carrot on her family’s farm. “It just doesn’t seem real yet,” she said. 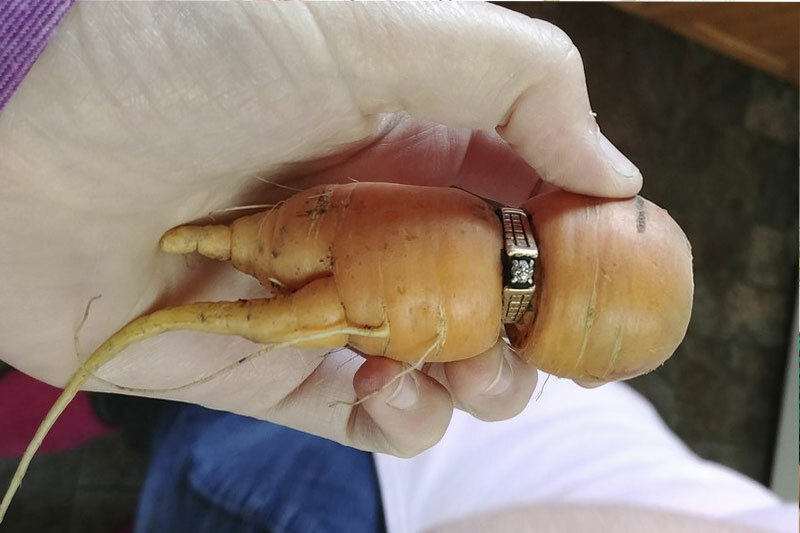 Grams found out about the ring from her daughter-in-law, who phoned on Monday after plucking the ring-clad carrot from the family farm. “She said, ‘Did you lose an engagement ring?’ And I said, ‘Yes,’ and then she started laughing,” Grams recalled. The 84-year-old lost her diamond ring in September 2004 while gardening. Despite searching the farm thoroughly, Grams couldn’t find the ring. “I cried for I don’t know how many days,” she said. Grams eventually settled for a replacement ring — a cheaper alternative — and told no one but her son. She said her late husband, Norm Grams, never noticed the difference. “Maybe he would’ve got a laugh out of this,” she said. Grams’ husband died five years ago. Despite being buried in the soil for more than a decade, Grams says the ring still fits perfectly.